This is the story of a Japanese Sake brewery that sparked a revolution against the modern sake society, in the city of Hasuda in Saitama prefecture, Japan. It’s called Shinkame brewery. 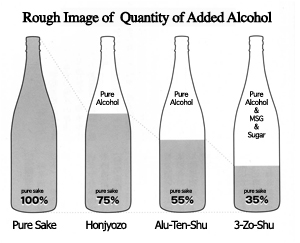 In the 1980’s, mainstream Sake had pure alcohol added to increase the yield. But this brewery’s owner, Mr. Yoshimasa Ogawahara, has challenged the traditional brewing method and has started to brew only pure sake, without any added alcohol.He is the first person to do this. Although his Sake is an object of avid desire from Sake connoisseurs nowadays, it has taken a lot of effort for his Sake to be accepted. The right amber liquid quakes in a glass. It has an aroma like Shaoxing wine. This is very aged Sake that has matured for over 30 years. “Japanese sake can change its own flavor to something better or deeper by ageing. This very aged sake would harmonize well with 'shrimp in chili sauce', I guess.” Mr. Ogawahara tells us with a giggle. Shinkame is a very small brewery which stands silently in a thickly wooded area in a tableland of Musashino city (which has been developed for housing) and has been running since 1848. It is generally known by its the name brands, Shinkame or Hikomago etc. Mr. Ogawahara is the 7th generation Shinkame owners. In Japan, he was the first person to change his Sake production over to all natural ingredients in 1987. People said that Sake used to be ‘Pure Sake’, before World War 2. (Japanese sake was pure, before World War Ⅱ.) But breweries began to add alcohol due to rice shortage during the war period by order of the Japanese government. This sake included sweetener and had synthetic flavoring to control its taste and became the mainstream sake after the War. This type of sake is called ‘Alu-Ten-Shu' (sake with alcohol added during fermentation) or ‘3-Zo-Shu' (sake with additives that make up 2/3 of the quantity). Even after the ‘Rice Cultivation Reduction Policy’ of the Japanese government, pure Sake never revived because alcohol added sake had become a national-policy. The former Ministry of Finance had issued the decree which forced breweries to brew 35% '3-Zo-Shu' of total products of sake until 1972. “Sake will die unless brewing pure, high quality Sake is resumed”. He made an application to brew pure sake to the taxation office but it was refused because there wasn’t a precedent. In 1967, finally, he was permitted to try brewing only 3000 liters of pure sake. The quantity of his pure sake was increasing year by year but the taxation office was an obstacle against him. “All kinds of harassment continued for 20 years”. The taxation people treated the maturing Sake as dead stock which gave him a limit on the quantity brewed in the next year. The taxation office disapproved of him making pure sake. Mr. Ogawahara was furious at the tax people who commanded him to go back to brewing only the regular stuff, 3-Zo-Shu. “The regular stuff is pure Sake, right? Give me a discontinuance order for my business if you would like to continue such harassment!” He had once lost sight in his left eye on his way home from taxation office. He had gotten a hole in the back of his retina from stress. In addition to the harassment from the taxation office, Mr Ogawahara could not afford to pay the traditional selling bonus to the liquor stores, making the local stores less enthusiastic in selling his pure sake. He gave up selling at local liquor stores and began looking for shops outside the local market, around the Kanto area on his own. “Our sales per year were 50 million yen, and I had already borrowed 500 million yen. I felt like I was in hell“ He had rushed around trying to raise money by selling land, which he had inherited from his ancestors. Since he had to keep the quality of rice high he had his ‘Toji’ (the master brewer) wait for his salary and bought rice for Sake instead. His mantra became “I will never stop running this brewery which my grandmother protected.“ His grandmother (who lost her husband in the Sino-Japanese War when she was in her thirties) passed away at 101 years old in 2004. She protected the brewery alone as a woman under the pressure of wartime control to close down breweries. Mr. Akira Oze the author of the socialistic cartoon entitled “Natsuoko's sake” once told Mr. Ogawahara that he has a gift for tasting. He praised Shinkame’s Sake “It is really like a jewel. It showed me that matured Sake transcends flavors such as sweet or dry”. The materials of pure Sake are only rice, ‘Koji’ (Aspergillus oryzae on boiled rice) and water. Mr Ogawahara visits the rice fields themselves to find the best quality rice and to negotiate directly with the farmers. He brews sake using the 'futa-koji' method. It requires a lot of time and care. When he extracts the unrefined sake, even though it requires many people, he always uses the old traditional machine, ‘Fune’, to prevent damage to the flavor. He often had arguments with his Toji, or with his Kurabito, the staff who work in the brewery, whenever he disapproved of their methods . “People who came back from Manchuria (after the end of world war 2) had begun farming with much effort but the government disrupted them because they wanted to build Narita airport on their lands. How sorrowful“. He sympathized with people who had fought against the government in Narita and he has good relationships with organic farmers who were activists against the land takeover. Every year he goes out to help those farmers plant their rice seedlings along with some of his close admirers. People dislike sake year by year, so the number of breweries has decreased by half since the 1960s. People say that 80% of them are not breaking even and are in the red. Only 20 in 1300 breweries are brewing only pure Sake (which accounts for 18% of the total quantity brewed in Japan). It seems the volume from these breweries is continuing to increase. Mr. Ogawahara is instructing and encouraging breweries who want to change to brewing only pure Sake. He says “If you endure for 5 years you will be able to change your brewery” Recently he has been involved in starting a fund for helping breweries which want to change their methods. His dream is that Sake will become a premium alcoholic drink all over the world. If income compensation is provided to farmers the price of rice will be reduced, along with the price of sake. Eventually it can be exported at a reasonable price and taxed appropriately. The period of relying on the automotive industry has come to an end due to the the economic downturn.